Do you have a rough and tough little cowboy? If so, these Cinch boys White Label jeans are just for him. These jeans have a dark wash with sanding and whiskering for cool faded style. 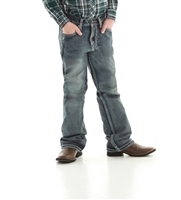 This pair of Cinch jeans will look great with a Cinch button down shirt and his favorite pair of cowboy boots. These stylish jeans are sure to become one of your new, everyday favorites! This is go-anywhere, do-anything denim. From the schoolyard to the barnyard, these jeans can handle it all! Built tough and nicely styled, our B4 Relaxed Fit jeans were made to keep up with a boy on the go. Every young man needs a pair of jeans that stacks well over boots. Rock & Roll Cowboy brings these dark wash Double Barrel straight leg jeans. 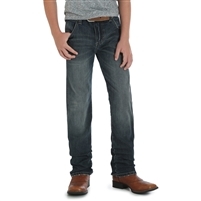 These boy's jeans by Ariat are in a medium wash with relaxed fit boot cut styling, five pocket styling, open back pockets, and brown contrast stitching.